fficcess Free is a cross-platform personal information manager that can help you organize and plan your business and private life. With Efficcess Free you can keep track of contacts, appointments, tasks, to-do lists, birthdays, and much more. The software also gives you space for keeping notes, diaries, and even passwords. In order to be successful you need to be organized and efficient. 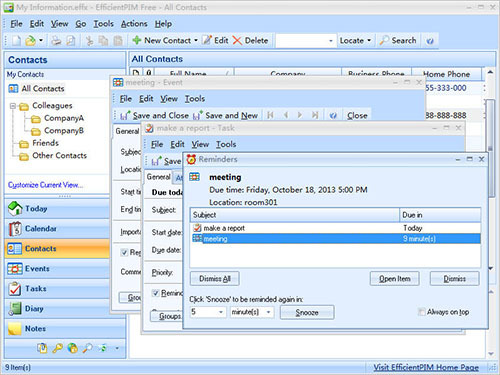 With Efficcess Free all of the things you need to manage are located in one, easy-to-use interface. And you can sync data across PCs and mobile phones. 1.Speed up devices search in sync page. 2.Open file which is with some special characters. 3. Fix bug:Some groups can not be shown out in group list for some cases.4.Enhance the security of "Require login from minimized state"option.5.Other enhancements/bugs are handled in desktop version and App.